Deir ez-Zor (Arabic: دير الزور‎‎ Dayr az-Zūr; Syriac: ܕܝܪܐ ܙܥܘܪܬܐ Dayrāʾ Zəʿōrtāʾ) is the largest city in eastern Syria and the seventh largest in the country. Located 450 km (280 mi) to the northeast of the capital Damascus on the shores of the Euphrates River, Deir ez-Zor is the capital of the Deir ez-Zor Governorate. In the 2004 census, it had a population of 211,857 people. Among Syrians and neighbouring regions, Ad-Deir is used for short to indicate Deir ez Zor. The current name, which has been extended to the surrounding region, indicates an ancient site for one of the Early Christian secluded monasteries spread since the persecution times and Apostolic Age throughout Mesopotamia. Although Deir, which is Arabic for "monastery", was thought to be kept throughout Medieval and Modern Age renaming, Zor, which indicates the riverbank bush, appeared only in some late Ottoman records. In Syriac, Dīrā Zeʿūrta means "small habitation." France occupied Deir ez-Zor in 1921 and made it the seat of a large garrison. Meanwhile, the region was locally ruled by Haj-Fadel Abboud, a member of an aristocratic family. In 1941 British-led forces defeated the Vichy French during the Syria-Lebanon campaign, which included a battle over Deir, and they handed administration of the region to the Free French. In 1946 it became part of the independent Republic of Syria. Since the Syrian civil war, armed military clashes erupted in the city between the Syrian Armed Forces and the Free Syrian Army (associated with the National Coalition for Syrian Revolutionary and Opposition Forces) and other opposition organizations such as Islamic State of Iraq and the Levant and Jabhat Al-Nusra (the US has blacklisted the Jabhat Al-Nusra as a terrorist organisation in response to its bombing campaigns). On 21 September 2014, the Armenian memorial complex was blown up by militants of the Islamic State of Iraq and the Levant, who had formerly been part of al-Nusra Front. On May 15, 2015 at al-Amr, elite United States military forces attacked and killed ISIS militant Abu Sayyaf who was targeted for his financing of the war. Deir Ez Zor district has been for more than two years one of the few remaining Syrian Government strongholds in Eastern Syria. In May 2015, Islamic State militants launched an offensive, capturing Palmyra and cutting off the remaining supply line to Deir ez-Zor. The city was then effectively under siege by ISIS, leaving supplies to be solely delivered by transport helicopters. ISIS attempted to stop the supplies by daily attacking the Deir ez-Zor Airbase. However, their attempts failed due to the presence of elite Republican Guards of the 104th Airborne Brigade led by Brigadier General Issam Zahreddine. The siege led to the shortage of food and fuel in the city with frequent blackouts and meat reported to cost up to $30 in late 2016. World Food Programme and Russia air-dropped aid. In January 2015 Russian Lieutenant General Sergei Rudskoi said that 22 tonnes (48,501 pounds) of humanitarian aid were dropped over Deir ez-Zor using Russian parachute equipment on Syrian Il-76 transport planes. In late 2016 the Syrian government was distributing free bread rations to the residents of the city through the Syrian Red Crescent society. In August 2015, the Syrian government had suspended five bakeries providing the locals with food in order to distribute it to its soldiers, security personnel, and their families. Al-Masdar News reported that in August 2015 civilians could be evacuated from the city for approximately 80 US dollars. Most of the 100,000 besieged civilians remain poor and jobless from the ongoing fighting. 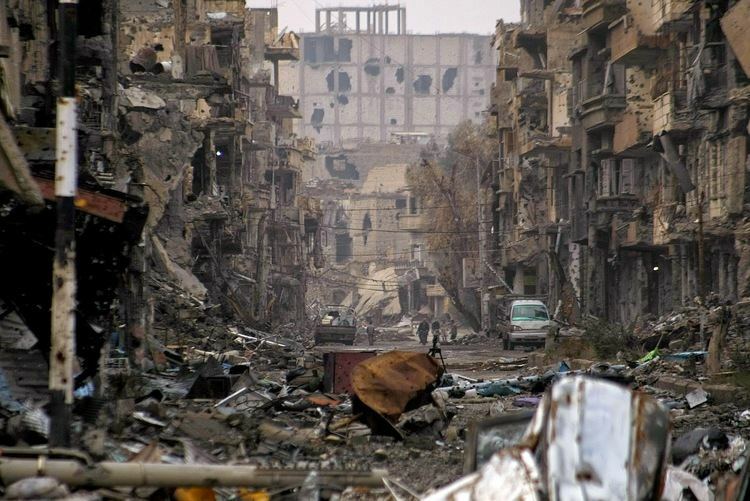 On 17 January 2016, a massacre of the city′s civilian population was reported to have been perpetrated by ISIS, who were said to have also abducted 400 civilians during a bloody assault on the city. However rebel activists told the BBC reporters that there had been no killings or abductions on a large scale. On 17 September 2016, US airplanes struck a target of Dayr Az Zawr. Centcom declared that they halted airstrikes when they were informed by Russian officials that the target hit by US airplanes may have been a Syrian Arab Army target. RT reported that 62 Syrian Army soldiers were killed. The Syrian Arab News Agency said that an ISIS assault on the Syrian Army began right after the US airstrike. On 18 June 2017, Iran's Islamic Revolution Guards Corps (IRGC) fired six surface-to-surface mid-range ballistic missile from domestic bases targeting ISIS forces in the Deir ez-Zor Governorate in response to the terrorist attacks in Tehran earlier that month. Aerial videos by IRGC drones flying over the city during the operation, confirmed the success of the mission. On 2 September 2017 the first line of SAA coming from al-Sukhnah managed to reach the stronghold and join the besieged area. Shortly thereafter, the siege was officially lifted. The majority of Deiries (from Deir ez-Zor) are Arab Muslims, with few Kurdish, Armenian and Assyrian/Syriac families. Successive waves of new settlers from surrounding countrysides and provinces were heavily related to severe drought in late 1950s and 1990s most of them looking for standard jobs and giving away farming and herding life-style. Mesopotamian dialect of Arabic is used in the city, with slight influence of the North Syrian one can be noticed as well. Dominated by Sunni Muslims, Christianity in Deir ez-Zor can be traced back to the Apostolic Age, with few active churches and chapels belong to different congregations. The city was also famous for the Deir ez-Zor suspension bridge (Arabic: الجسر المعلق‎‎) which spanned the Euphrates and was destroyed in 2013 during the civil war. The Deir ez-Zor Museum keeps thousands of antiquities collected from nearby archeological sites in Northern Mesopotamia. Main campuses of Al-Furat University and Aljazeera University are also located there. Many other polytechnic schools and professional institutes provides tertiary education are based in the city as well. The local daily newspaper Al Furat and few other publications are published there and circulated in neighboruing Al-Hasakah and Raqqa governorates. Deir ez-Zor is home to the third Armenian diplomatic mission in Syria; the Honorary Consulate of the Republic of Armenia, opened on 11 February 2010.
Notable people from Deir ez-Zor include politicians Riyad Farid Hijab, Ahmad Tu'mah and Riad Darar, military commanders Ramadan al-Shallash and Jassem Alwan, footballers Omar Al Somah and Oday Al-Jafal, and designer Rami Al Ali.